Meal plans: Displays only the rates of the selected meal plan. The options are the typical “free breakfast”, “half board”, “full board” and “all-inclusive”. Free cancellation. Hides all non-refundable rates or any which are outside the cancellation period. Pay at the hotel. Hides all ‘pay now’ rates (usually non-refundable). Express Booking. Only shows channels with the trivago Express Booking feature enabled. Mobile exclusive. What’s more, in cases when the user is searching on a mobile terminal, trivago has just added a new filter which will only show exclusive rates for mobile devices. Several channels use rates like this to capture more sales and now they will have more visibility and more users will be able to benefit from them. When applying these filters, the user sees a reduced number of booking options, yet receives better quality in terms of results. And this is where the opportunity comes up for you. Your goal is to ALWAYS be present with your direct sale, regardless of which filter the user selects. If you are present, you’ll have access to more users and, therefore, more hits and more bookings that would otherwise end up with OTAs. Also, you’ll improve the performance of your campaigns, which is very important and always a fiercely-debated issue. In essence, metasearch engines highlight the cheapest rate available. Therefore, it’s normal that they’re biased towards selling the cheapest products and rates, as these are the ones that are featured the highest. Here’s a comparison of sales per meal plan of Mirai customers. Meal plan filters will be particularly useful and important for hotels with a lot of sales outside the ‘room only’ plan. We’re clearly referring to holiday hotels here, but also to international sales and to the corporate segment at urban hotels. Another of the major problems of metasearch engines is that, in many cases, the cheapest rate is a non-refundable rate. This makes the “non-refundable” weighting of sales on metasearch engines higher than normal (up to 8% difference). But many users are actually looking for “the best rate within the flexible ones”, which up to now had been very complicated. From now on, trivago is offering a one-click option of hiding all non-refundable rates, so we could expect that these users will turn to trivago when they had previously ended up with OTAs, as this filter is one of the most popular. The payment option is another of the variables that has more weighting when it comes to booking accommodation. Many users don’t really mind about paying now or paying at the hotel. However, many users do mind and actually prefer, as long as it’s possible, to pay at the hotel and not in advance. 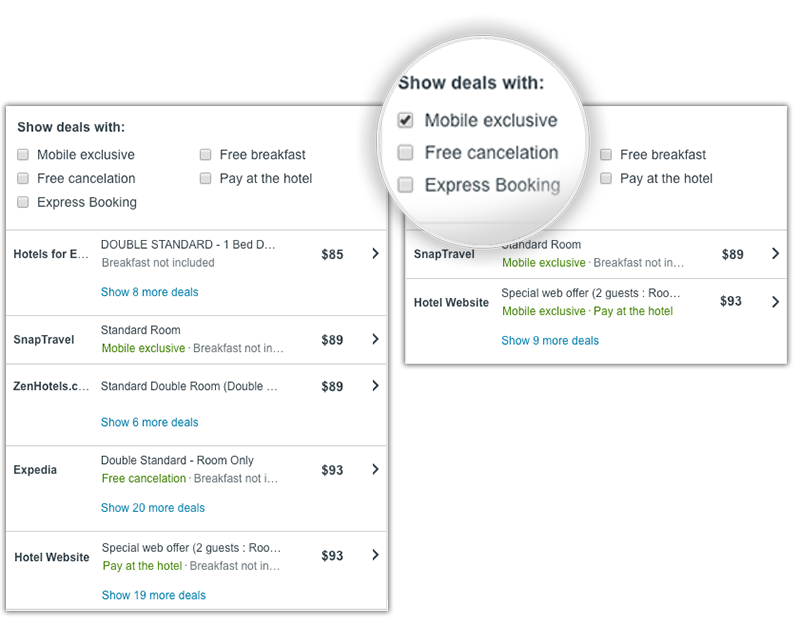 If the user enables this “pay at the hotel” filter, booking options will be drastically reduced. Only the channels with which you have a direct payment contract will actually be visible, i.e. 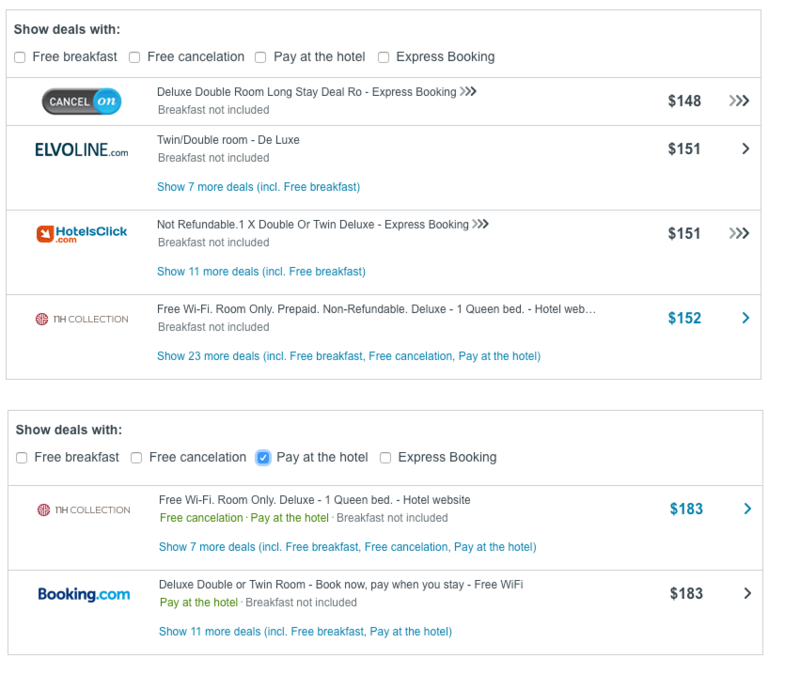 Booking.com and Expedia if you use this option (as well as their sub-brands Priceline.com, Hotels.com, Travelocity.com, Orbitz.com, etc. ), while the filter will leave out all the OTAs with which you don’t have a contract and that usually “break the rate parity” (and which never use the “pay at the hotel” option). 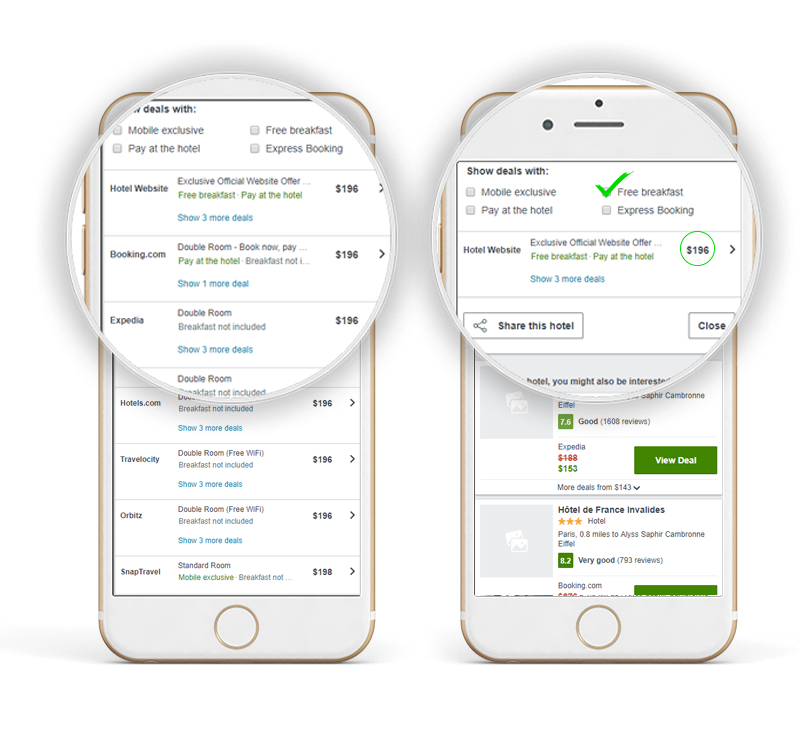 One of the environments where direct sales suffer the most is mobile, as OTAs are the natural terrain of customers using a mobile to check or compare rates. This has long ceased to be a technological challenge and today is a one-sided war between a multi-destination and multi-hotel environment (such as OTAs) and a typically single-destination and single-hotel environment (such as direct sales). What’s more, some OTAs offer greater mobile visibility in exchange for a higher commission (or better rate). 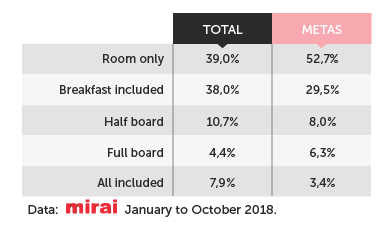 These rates are solely for mobiles and, therefore, are the only ones that will be visible when the user applies the “mobile exclusive” filter on trivago. You can do the same in your direct channel and offer exclusive discounts to customers who book via their mobile. This is a strategy purely to “more aggressively persuade” customers to book on your website and who would otherwise end up with an OTA. 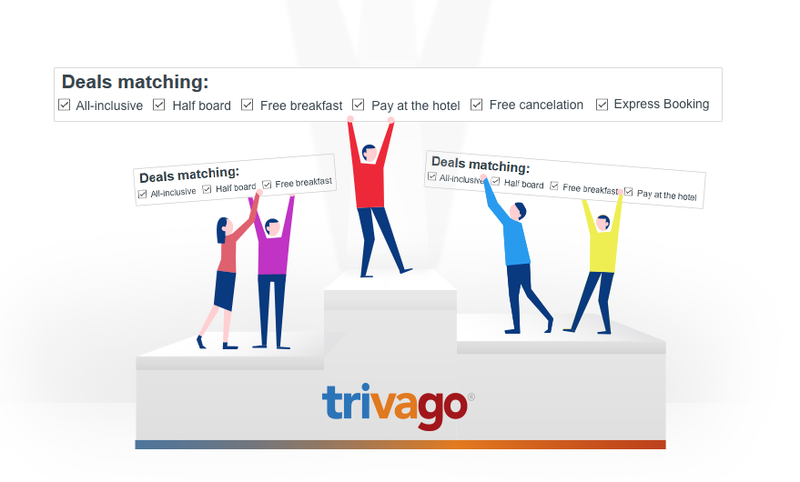 This is a feature that trivago launched in 2017 to help hotel advertisers improve their conversion rates in its CPC auction marketplace, as well as to make it easier for the user to complete their booking without the hassle of going to the OTA or hotel website, which runs the risk of the user getting distracted along the way. It’s clear that trivago wants to give more visibility to this feature and that there will be more and more users choosing this way of booking as their preferred option. As it’s yet to be a commonplace option among OTAs, it’s an interesting option to enable in your direct sale. So that your direct sale can show results according to whether the user chooses one filter or another, you need an integration partner that correctly uses the metadata sent to trivago along with the rates. Metadata is a set of attributes linked to each rate and adds extra information such as the associated meal plan, the cancellation policy or the option of a mobile rate, among other things. The new trivago filters interpret this metadata and hide or display options according to the selected filter. If you currently have an integration with trivago on your direct channel, look for your hotel and apply the different filters. If your entries disappear as you add filters, your integration isn’t enabled for the use of filters. You may have some enabled and others disabled. The difference is in the quality of the integration with trivago. Here at Mirai we work a lot on trivago integration and we can comfortably state that our connectivity is compatible with all existing filters, including “mobile exclusive” rates and integration with trivago Express Booking. In fact, we’re one of the few integration partners with this feature. The new trivago filters are a great improvement in terms of usability for finding the hotel and rate that each user wants. A more satisfied user is a higher quality user, and therefore more prone to booking, which will end up with better results in your campaigns on trivago. 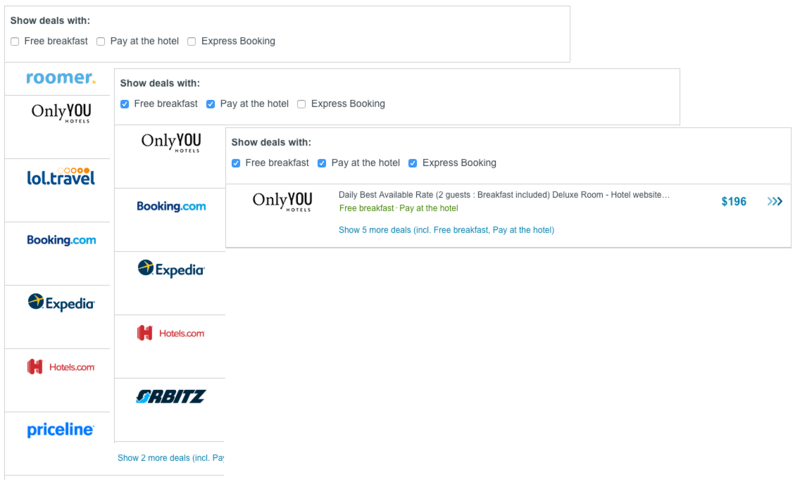 The use of these new filters will let you stand out above your competition by highlighting your direct channel over OTAs, thereby making it easier to direct customers to your website. If you already invest in trivago, you should thoroughly review your campaigns, deals and rates and make sure that you’re always present in all possible filters. If you invested some time ago, but no longer do so, it’s time to think about giving it another go. And if you still don’t invest in trivago, it’s a good time now to start. Whatever the case, check with the company that provides connectivity to trivago and ask them for more details.